One of my family members has been sick with the flu, and I was wishing I could give him some of my favorite immune boosting tonic. But, he is in another state, so that isnt possible, at least not in time for his current illness. So, that got me thinking I should share this, as it is sure a handy thing to have around, and I swear by it. 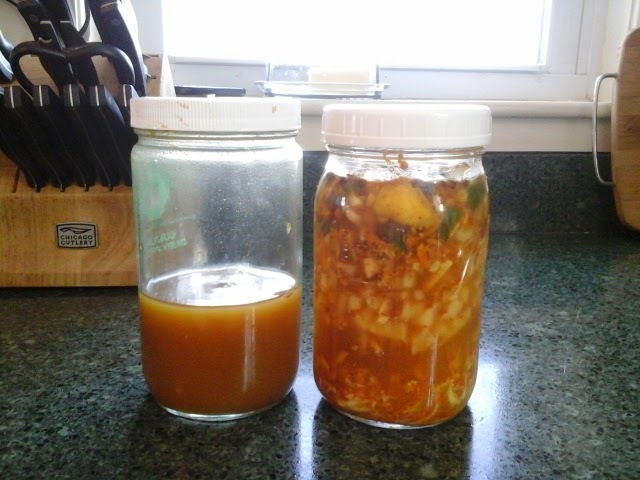 In the fall, I make up a big batch before cold and flu season starts. Though I rarely get sick, I picked up some bug during our travels, and could just tell that it wasnt going to be a simple cold. I was achey, tired, stiff neck, sore throat...it was going to be bad. I started dosing with two tablespoons of fire cider that night, and three times the next day. When I woke up the next morning, I was completely symptom free, not even a runny nose. This really works for me. Fire cider, also called Mother Tonic, has a long history of healing as a folk remedy. And no wonder. Every ingredient has research-proven immune boosting anti-viral, antibiotic, anti fungal properties, and it is infused in raw apple cider vinegar, which contains powerful gut healing probiotics. My feeling is, it cant hurt, and just might really help! So, lets get to making some! There are some variations of recipes,. This is the one I use. 1/2 tsp cloves, or a few whole cloves. 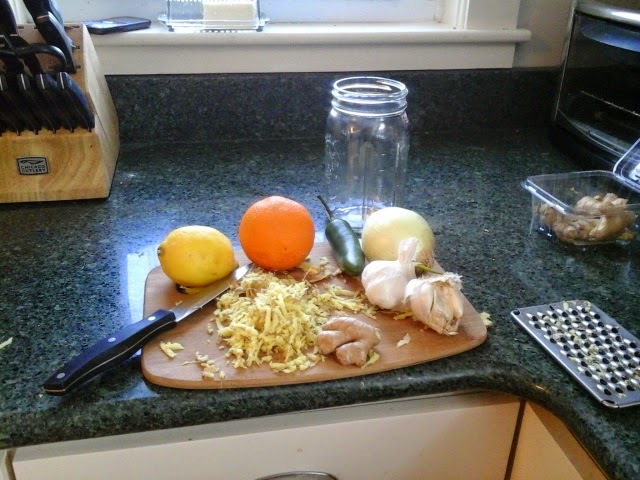 Chop, grate, process... all this and put into a glass jar. 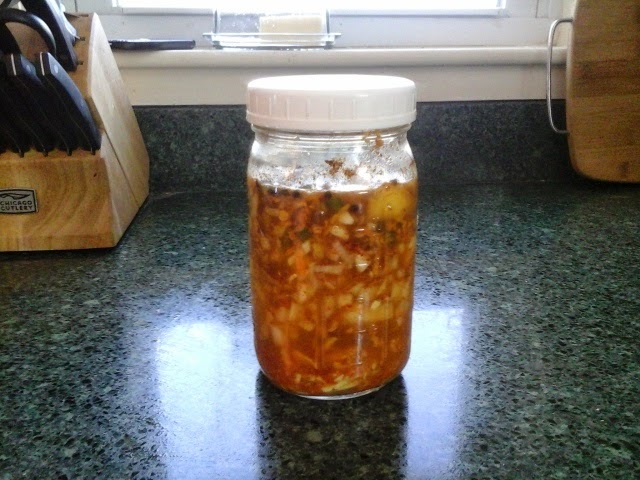 A quart canning jar is a perfect size. If you are using a metal lid, put a piece of wax paper under the lid, since the vinegar can cause some corrosion. yeah, it takes that long for all that goodness to extract. 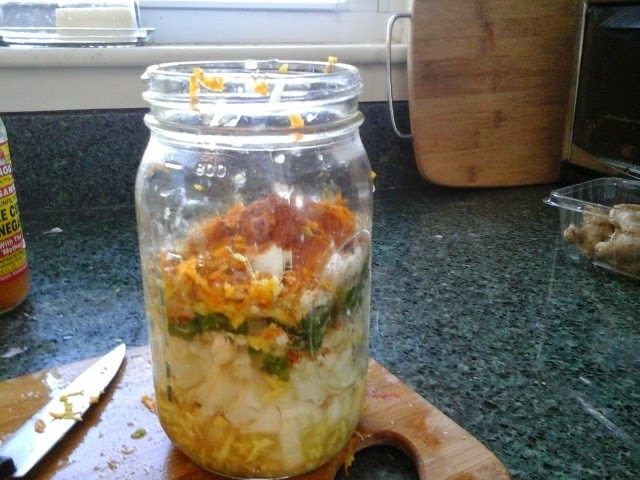 After a month, strain the concoction, squeezing the pulp to get as much liquid out as possible. Now, add 1/2 cup of raw honey. it must be raw, unprocessed honey. You can add more honey to taste. This stuff is surprisingly GOOD! It does not need to be refrigerated,( though you can) and should keep quite awhile in your cupboard. And now you have some Fire Cider! 1. straight, by the tablespoon full. 2. If that is too strong, put two tablespoons in a cup of hot water and sip as a tea. 3. made into a salad dressing. This, by itself with a bit of olive oil, makes a delicious salad dressing. I personally dont use this as a daily tonic, but keep it for when I feel the need for an immune boost. I usually do a couple tablespoons three times a day. Here is some finished cider next to the batch I just made. Weather today is cold 8 degrees)and mostly sunny after some light snow last night.